It's more than mere geography, and there are actually some pretty rigorous rules concerning what can and cannot be called a Montreal style bagel. 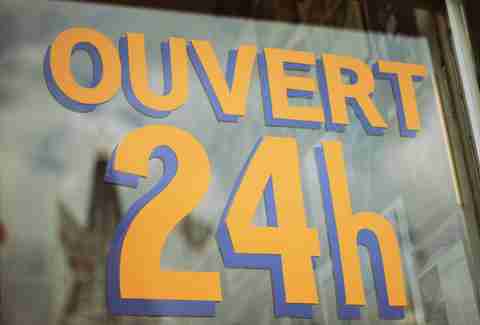 As such, there are only two consistent, stalwart contenders for the title of Montreal's finest: Fairmount Bagel and St. Viateur. In order to be considered "Montreal style", they have to be hand-made, while those NY bagels can be (and are) made by soulless, and probably quite aggressive, machines. Another stipulation? 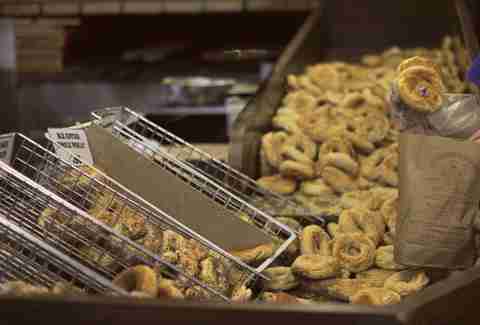 Montreal bagels are baked in special wood-fired ovens, where the flames gently lick each bagel a little differently, and they all come out blushing in their own special hue. 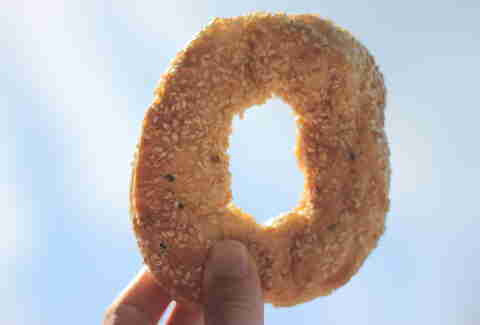 It also means that, as with vaunted newcomer Brossard Bagel, they're crispy on the outside, and soft on the inside. Like You. See? 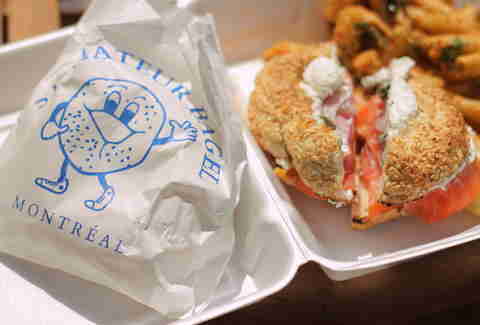 Montreal bagels get you. Yup, honey-infused water. 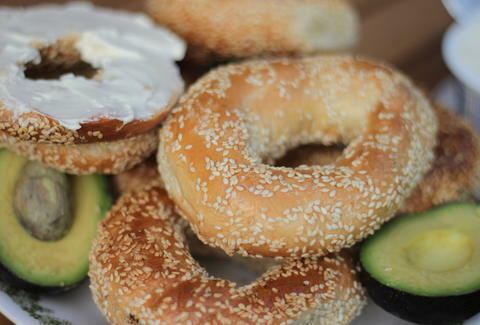 Montreal bagels are all poached in it before being sent off to the ovens. 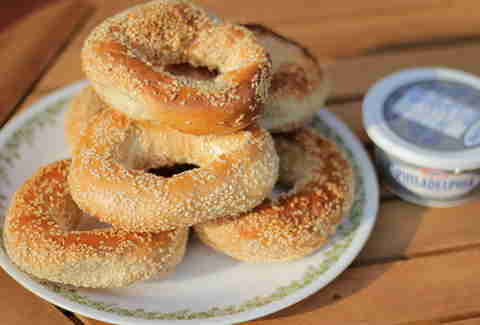 Beauty Bagels use 1 1/2 cups in each of their small-batch pots. And there’s no salt in 'em! 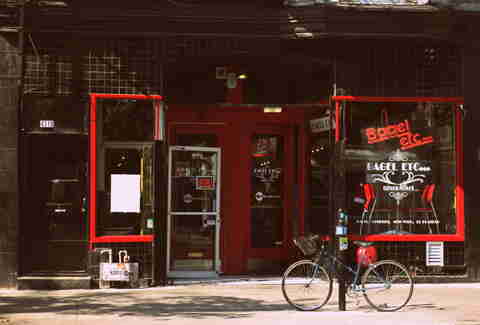 In 2010, New York Magazine named Brooklyn resto Mile End the best deli in their “Best of New York” feature. 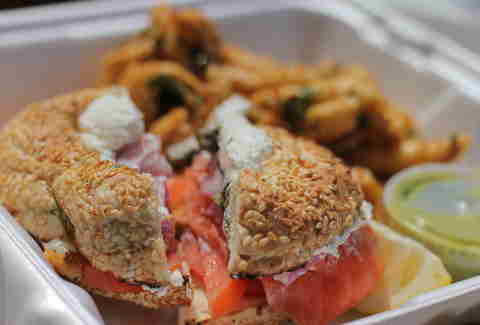 The deli, named after the Montreal neighborhood, serves up Montreal-style bagels. The standard has become so high that customers generally don't want anything other than the classic recipe (St. Viateur sell 90% sesame bagels), though if you do want something slightly Wonka'd, then Bagels on Greene will likely provide it, and Bagel, Etc. will give you a bagel Eggs Benedict, or Huevos Rancheros. When Gregory Chamitoff took off as a crewmember on Expedition 17 in 2008, he brought three bags of Fairmount’s sesame bagels with him into space, meaning there are now some new rings around Saturn.